On June 22, 2018, The Wall Street Journal declared that Americans are facing a financial catastrophe. For the first time since Harry S. Truman was president, the next generation of retirees will be in worse financial shape than the prior generation. More than 40% of U.S. households won't be able to maintain the living standard they enjoyed while working after they retire. The reason is straightforward: we're not saving enough. In a recent National Housing Partnership Foundation study of 1,000 non-retired baby boomers, one-third reported having no retirement savings. Despite that stark reality, 70% of the respondents had no problem with their circumstance. Instead, they were at least somewhat confident that things would work out. Thankfully they have jobs! "How America Saves" is an annual Vanguard report that reviews their clients' savings habits. Being one of the nation's top service providers for defined contribution plans such as 401(k)s, Vanguard's findings are representative of how American workers are preparing for retirement. The 2017 survey found that the median employee had an account balance of just $26,300. Remember, the "median" is that strip of land that divides the road in two halves, which means half of Vanguard's accounts had saved less than $26,300 – that's practically nothing! Looking more closely at long-term patterns, remarkably, that median value hasn't changed in close to a decade, even after generously adjusting for both inflation AND the positive impact of a nine-year bull market in domestic stocks. What a missed opportunity. How did we become so fiscally irresponsible? Post-World War II Americans didn't have to worry much about their retirement, and therefore, how much money they had in the bank. In 1935, the Social Security Act took care of that, guaranteeing Americans a base level of welfare in their retirement. Post-World War II corporate America was very generous to its workers. Soldiers returning home received guaranteed pensions as part of their employment benefits package – true in both public and private roles. If you were an especially prudent individual, there was a third source of retirement income to count on: after-tax savings accumulated during your working career. These income sources make up the three "legs" of your retirement stool: Social Security, employee pensions, and personal savings (including IRAs and 401(k)s), For just showing up to work, our parents' generation was guaranteed the first two of these, ensuring comfortable retirement lifestyles. Contrast that experience against our situation today. While previous generations enjoyed corporate-sponsored pensions, today's generation of savers is left self-administering their personal 401(k)-type plans. The responsibility for saving and then thoughtfully investing one's savings has shifted away from the corporation to the individual. While we are still entitled to receive Social Security, no one can be expected to live on that leg of the stool alone. However, few of us are educated on how to build those two additional legs of savings during our working lifetime. Master Edwards, my daughter's childhood taekwondo instructor, always reminded his students: "Practice makes permanent." With no good role models teaching us how to save, Americans today practice bad financial habits that have become permanent. Time is running out for too many of us, leaving only one unrealistic strategy: Hope. As we enter 2019, in hopes of helping you build good financial habits that become permanent, we plan to produce a follow-up white paper where we will share sound savings strategies, explore the concept of how much savings is "enough", and look deeper into how much you'll need for retirement. 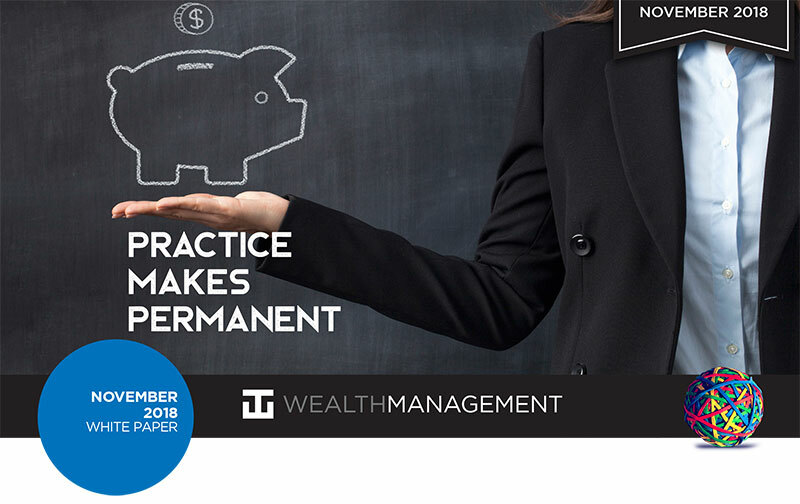 WT Wealth Management is a manager of Separately Managed Accounts (SMAs). With SMAs, performance can vary widely from investor to investor as each portfolio is individually constructed and managed. Asset allocation weightings are determined based on a wide array of economic and market conditions the day the funds are invested. In an SMA, each investor may own individual Exchange Traded Funds (ETFs), individual equities or mutual funds. As the manager we have the freedom and flexibility to tailor the portfolio to address an individual investor's personal risk tolerance and investment objectives – thus making the account "separate" and distinct from all others we manage.